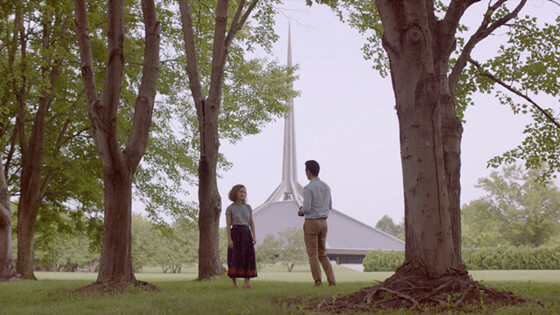 There is a reason why the story of film-critic and web-blogger Kogonada´s directorial-debut Columbus touched the heartstrings of the few people who have seen it. The way it portrays an encounter of two people, both connected to architecture and the city they meet in, is told most of the time through the city itself. But when the characters speak, it feels innocent, yet honest. Both articulate themselves of what they say and what they do not say, but in the end, they understand each other. Kogonada´s writing is essentially, pretty simple, but almost completely effective. He establishes empathy and understanding for two human beings, meeting at a (possible) turning point in their life in combination with the haunting, yet beautiful cinematography, they create a sort of architectural work of the human soul itself. But also, Kogonada spares the audience with too much conflicts, which prevents it from becoming too heavy. Thus, Columbus becomes a short poem of immanent beauty that probably makes both Jim Jarmusch and Richard Linklater proud. Yet, it remains possibly the most painfully unseen movie of 2017. The magic behind Sean Bakers´s The Florida Project lies in the authentic feeling the movie carries within. Nothing in the movie really feels written or crafted but just as a piece of life we get to witness. Ironically, to establish this naturalistic effect, it takes a great writer, who Sean Baker and co-writer Chris Bergoch prove to be with this movie. The Florida Project floats above the childish innocence of young Moonee while following her and her friends on their adventures through their “kingdom”, which happens to be a Motel in Florida, near Disney World, and the bleak world of white-trash poverty she grows up in. While in many other movies that both portray realism and escapism, one of the two aspects has to step back for the other, The Florida Project succeeds in shedding a light on both aspects that could not work without one another. The greatest achievement of the screenplay, however, is that it takes the character of Moonee seriously. While many other movie would have reduced her to her innocence and cuteness, Baker and Bergouch write her in a way that she feels like a typical child. While she obviously is not fully aware of the world she lives in, she immediately notices when something is wrong around her. Of course, the acting of Brooklyn Prince also plays a major part in bringing this feeling to life. Yorgos Lanthimos is the kind of writer/director whose movies you can immediately identify through the spoken dialogue. Nearly all the characters in his movies utter their words in a way that seems to be extracted from all emotions, that seems so neutral that it makes one feel uneasy. 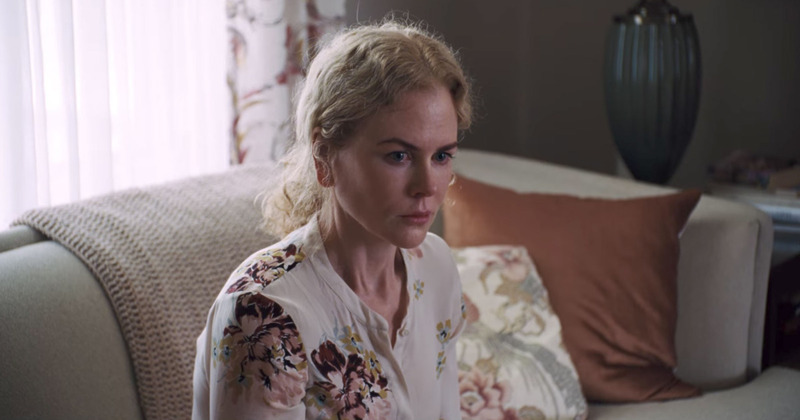 While the behavior of the characters in Lanthimos’ previous work The Lobster felt fitting due to its weird setting, in The Killing of a Sacred Deer, it creates immediate tension and irritation. While the interaction within the family of a heart-surgeon in the beginning of the movie seems normal, as soon as they open their mouth, it feels uncanny. We, as the audiences, are left in the waiting of a bomb that is about to drop. When we are later introduced to Martin, a quiet boy the main character Steven has a strange relationship with, this boy in his behavior just fits right into the movie as a key-character that will bring chaos over everyone. Lanthimos has crafted a disturbing interpretation of the greek tragedy of Iphigenia, transporting it into the modern way and thus created a haunting vision of revenge that is able to run goosebumps all over your body with a single line of dialogue. 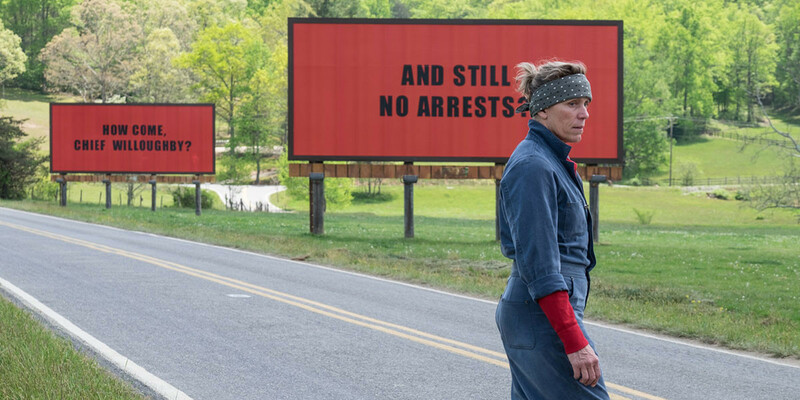 You can praise the screenplay Martin McDonagh has created for his dark-comedy Three Billboards Outside Ebbing, Missouri foremost for balancing the elements of tragedy and comedy in a way that both elements are depended on one another. The serious aspect of the movie would not work without the comedic relief. But it does no stop there: What makes McDonagh’s writing so impressive is the multiple layers he adds to his characters and the empathy he provides for them. At first, protagonist Mildred Hayes, a mother who lost her daughter to a crime that the local police is unable to solve, seems to be driven by pure anger and the seek for vengeance. But on a second look, it becomes clear that her motivation behind setting up the provocative Billboards is also a way of compensating her loss and to make her suffering heard. However, the most well-written character-arc is given to the local police officer Dixon. While his racist tendencies make him a character worth despising in the beginning, as the movie progresses, he develops into someone who is capable of honest vulnerability. The reason that he does not get punished for his racism and it remains unclear if he changed this aspect of his character is something the movie got criticized for. Yet, this only proves the ambivalence of McDonagh`s writing. Dixon was only able of changing because someone had faith in him, and we as the audience are encouraged to have faith in him too. This, and many other aspects, make McDonagh`s writing a worthy top-contender for the Oscar for Best Original Screenplay. This Swedish satire about art and the European culture of the 21st Century sparked, when looked at it in retrospective, quite a controversial response. While many declared it worthy of its Palm d`Or-win at Cannes, calling it the film of the moment and perfectly capturing the self-awareness of society and its pressure for political correctness, others called it the pretentious piece of self-indulgent art that it tries to criticize. What makes the screenplay of Östlund so special is how he constructs his movie as the same art-installation that gives the movie its title, trying to extract a reaction, no matter good or bad, from the audience. The movie can be watched both as a comedy, but also as this art-installation. If you view it in the second way, it apparently makes more sense that many story lines of the movie does not seem to have a satisfying conclusion, because they are not supposed to work as a closed story, but rather as something for the audience to chew on. The infamous scene in which an actor plays a monkey and starts mocking the guests at a dinner-party comes out of nowhere and ultimately leads nowhere. Yet, it is a powerful example on how people react to situations that they don´t understand. In this way, The Square does not identify its audience as simple viewers but rather as participants. While this work of art will not reach everybody, it still is an amusing and revealing experience for those it does. The fact that the coming of age story about the sexual awakening of a 17 year old was adapted through the hands of James Ivory, a man in his late 80s, is baffling considering the fact how accurate it captures the spirit of young love. While director Luca Guadagnino paints a golden landscape of sensual images, Ivory provides intimate dialogue and colorful character development. 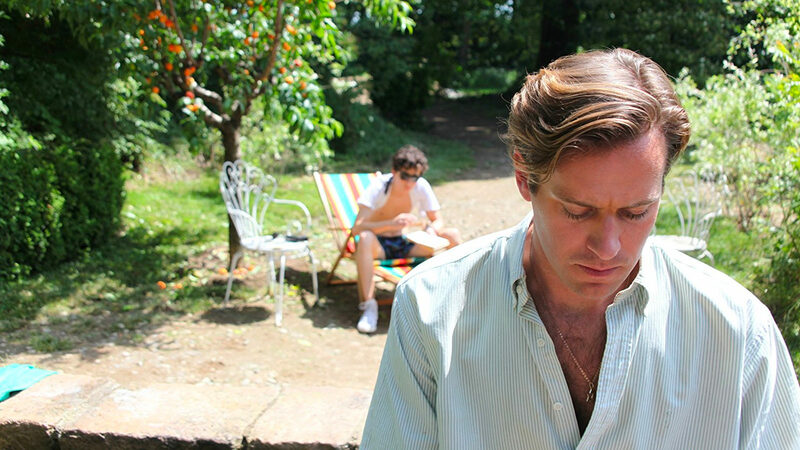 The greatest strength within the screenplay of Call Me By Your Name, is how Ivory purposefully omits certain information, putting the viewer in the perspective of protagonist Elio, who has yet to discover himself and what he wants. Thus, Elio is not really aware of himself but is even less aware of his new discovered love, the young American student Oliver. The way Ivory writes the character of Oliver is ambiguous. He is cast in a constant mystery. At some occasions, we seem to completely get his character and his motivation, but this illusion remains tricky. This plays into the main theme of the movie: The fact that, no matter how much we love someone, we will never be fully aware of who this person actually is. How Ivory builds this theme in his movie is one of the many accomplishments that make this movie so moving. The great thing about the screenplay of Paul Thomas Anderson’s most recent cinematic outing Phantom Thread is that it is so many things at once. The multiple aspects and topics that this movie covers could have all filled their own movie. At first, the movie seems like an exploration of the art of making fashion. For that matter, Anderson manages to introduce the character of Reynolds Woodcock, someone whose fascination in making dresses is written in such a way that the audience never looses touch with his character. While his manners and his way of keeping his daily routine might seem over the top, we never judge this as a simple obsession, but rather respect Woodcock for his dedication to his craft. Later on, the movie embraces itself as a study of an unhealthy relationship in which it combines two unstoppable forces, trying to shift one another. Anderson points out that the bond that binds Woodcock and his girlfriend Alma can only hurt them, but ripping it apart would kill them. How Anderson interprets this dysfunctional love never feels intellectual, but is painted with a deep rooted understanding of humanity. Phantom Thread is, most of all, another example of this writer/director’s love and compassion for the human struggle in search of genuine connection. In this matter, Anderson also creates scenes of tension and suspense in which the audience hides beneath their seats, anticipating a bomb to explode. But also, there are scenes in which the behavior of the characters create amusement and laughter. 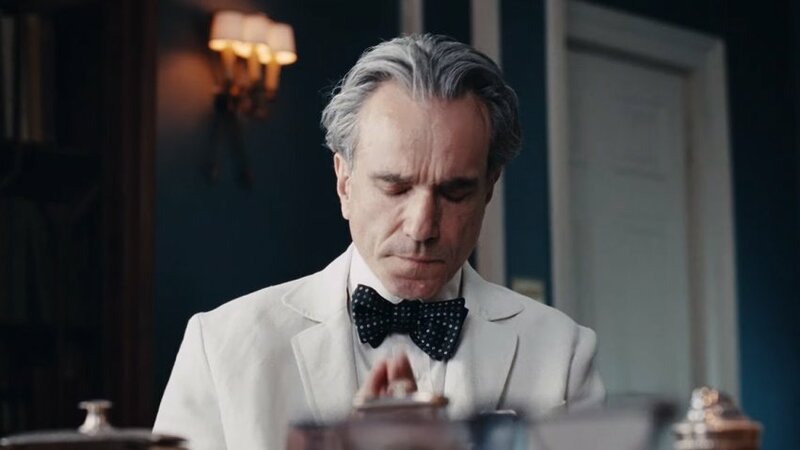 How all these elements work together makes Phantom Thread the movie of 2017 with the most fully fleshed out characters and a masterpiece in screenwriting.